Sermon preached at the 8:00 a.m. Graduation Worship Service, Santee Chapel, Lancaster Theological Seminary, Saturday, May 15, 2010. Electronic PDF document. 5 pages. Address given by Nancy Wilson at Lancaster Theological Seminary Graduation, Church of the Apostles, Lancaster, PA, May 14, 2011. Digital audio recording (mp3). Duration: 29 minutes. Address to graduates by Ed Aponte, Lancaster Theological Seminary, Santee Chapel, May 16, 2009. Digital audio recording (mp3). Duration: 14 minutes. Sermon preached by Jacqui Lewis at Lancaster Theological Seminary graduation, May 15, 2010. Digital audio recording (mp3). Duration: 32 minutes. 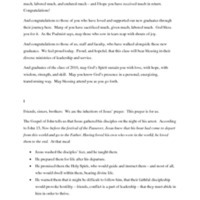 Baccalaureate sermon given to the graduating class of 2013 by Dr. Valerie Bridgeman in May 2013. Digital MP3 audio recording. Duration: 15 minutes, 50 seconds.